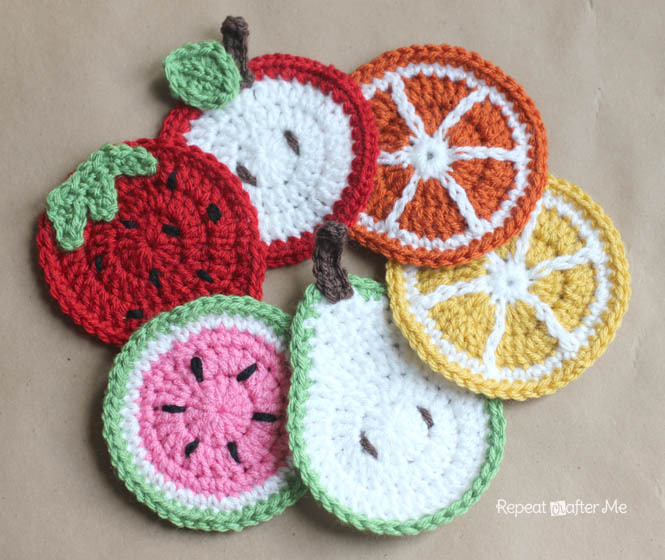 With the nice weather we are having, I was suddenly inspired to make fruit coasters. I love the way they turned out and I think they would be a fabulous hostess gift and a lot of fun to have out for your spring or summer get togethers! – Worsted weight yarn. I used Vanna’s Choice in Scarlet (red), Mustard (yellow), Fern (green), Terracotta (orange), White, and Chocolate (brown). You can find and purchase these at www.lionbrand.com. The pink in the watermelon is Red Heart with Love Bubble Gum . Chain 7, DC in second chain from hook, SC the rest of the way down chain. Fasten off leaving long tail to sew on to top of apple. 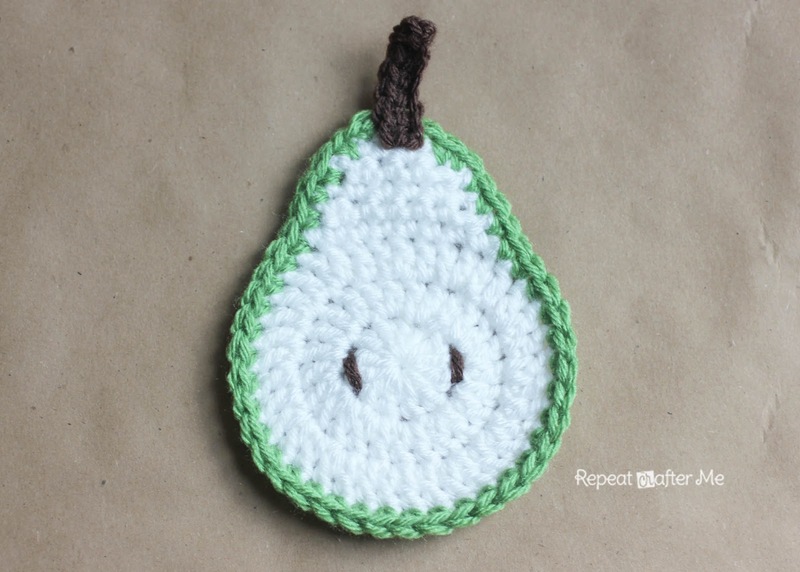 Leaf Pattern: I followed THIS FREE PATTERN from Easy Makes Me Happy. Finish by weaving or tying on brown yarn parallel to each other on either side of the first round. Round 4: SC in each stitch until you get to the last 5 stitches. In the last 5 stitches make these stitches: 2 HDC, 2 HDC, 2 DC, 2 HDC, 2 SC, join to first SC, fasten off and weave in ends. Chain 5, SC down chain, chain 5 again, SC down chain, chain 5 again, SC down chain and across the top of the first two leaves. Fasten off leaving long tail to sew onto top of the strawberry. 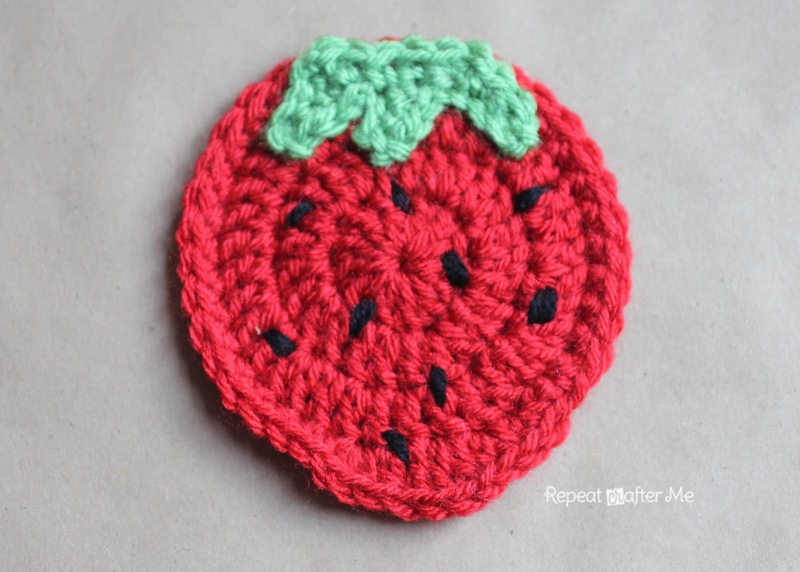 Finish by weaving or tying black yarn on in random spots to make the strawberry seeds. Finish by weaving or tying on black yarn for seeds. I made 6 seeds in a circle using round 1 as a guide. 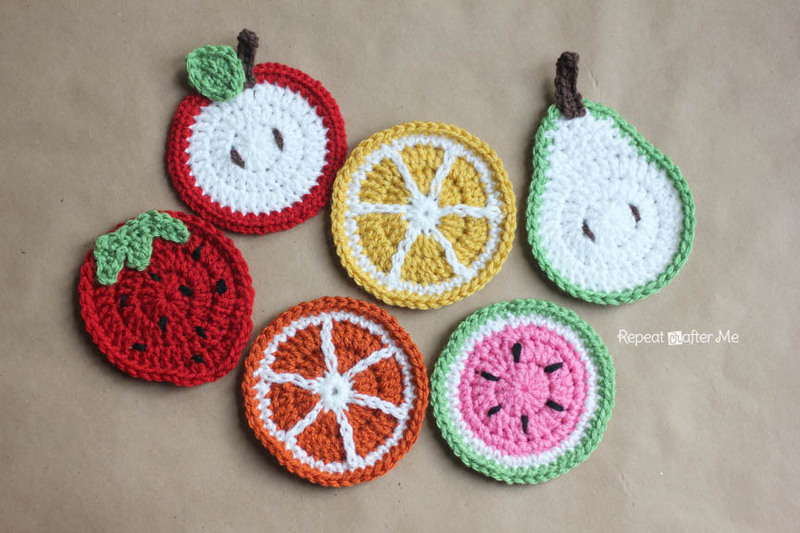 To make the fruit sections you will want to surface slip stitch with white yarn. 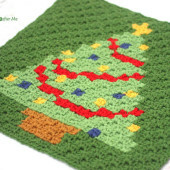 HERE is great tutorial on how to surface slip stitch. I did not make one continues surface slip stitch. I started and stopped 6 times to create each section line. You will want to make surface slip stitch lines shooting out from every other stitch in round 1 for a total of 6 surface slip stitch lines. Sorry, there are a lot of ends to weave in, but I found this way to look the best once complete. Change color to green and continue to SC around edge of entire piece, join to first SC, fasten off and weave in ends. 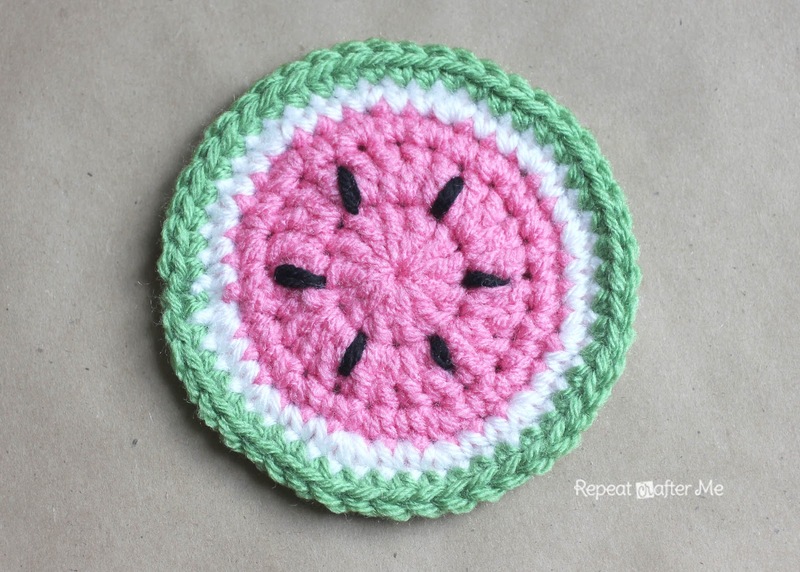 Finish by making the a stem and two seeds as described above in the Apple Coaster Pattern. You are oh so talented! I love all your patterns! Awesome job! These are adorable! I'll be making a bunch as gifts. Thank you. I like it, feeling Summertime to me! Love these! Great job, and thanks for the patterns! So cute Sarah! Pinning these : ) My kids would love them! Cute! Gonna try to make. I made your owl hats for my grandson and another for my cousin's neice. Thanks for your easy to follow patterns. You are so clever with your ideas and what you make!! I love your patterns!!! Thank you so much for sharing your design gift with so many. These are all super cute! LOVE them all! I did it the way you wrote it and it turned out fine. These are just adorable! Thank you so much for sharing. I could use any hint of spring/summer I can get! It is still cold in MN! Love all of your patterns and I use them frequently! Thanks again! Happy Hookin' on a Hump Day! So lovely, Tomorrow i will do them all. I love your patterns. Kisses from Spain. Adorable! 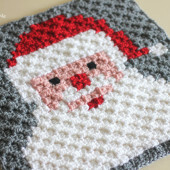 I linked to your pattern from my blog: cherishables-handcrafts.blogspot.com. So cute!! Thanks for sharing! I think they'll make cute end-of-the-year teacher gifts! 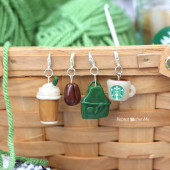 Thanks for sharing…these are so adorable!!!!! Adorable! I think I will try these! I wrote about these on my blog (of course linking to your blog) and got two orders for them.. thanks!! got to this pattern by lion brand's link. These are fabulous! thanks that we can sell projects made from your patterns and i will definitely link back to you! i have never been able to create a good pattern, tho i have tried! i often make changes and adjustments to fit 'me' but i will credit you even when i do that bcause i so appreciate your work and effort!! Thanks again! Já estou a pensar em fazer alguns trabalhos! precioso todo lo que haces! I had a blast making these! When I figure out how to post a picture to your blog I would love to share. On the citrus fruit for the surface slip at the end of each section I pulled a single strand of yarn all the way through (left it about 1.5 ft long, weaves over on the backside to where the next one should be and continued. That way I only have two ends to weave in. Lived these patterns! Thank you so much!!! hermoso blog muchas gracias por compartir los patrones besos desde argentina =) las peras me quedaron divinas!!!!! Do you know that these arr the easiest instructions to follow, thank you so much, in the process of making them all!! I made these for my new apartment and for my friend's! I'm going to start making these tomorrow. I want to do the Strawberry one for for a birthday card. 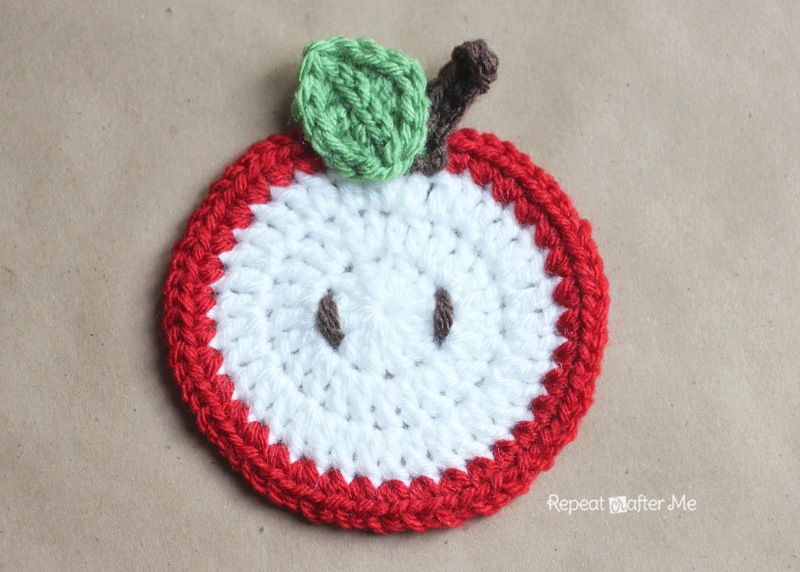 Dear Sarah, thank you so much for these patterns, i have been searching for a crochet apple coaster pattern and haven’t been able to find the right one. I just finished making one and it looks great (not as perfect as yours of course) but it still looked good. Thanks again. Miriam. Hi Sarah, Love these so much!! Really want to make them, but before I start, was wondering what the finished size is across? I have to tell you I come to your site all the time! I signed up All Free Crochet and they direct me here a lot. I really enjoy coming by and thanks for having me! You are a great host! I keep wanting to call you Diedra??? lol I bet you are a lot of fun! Thanks for the crochet tips!! 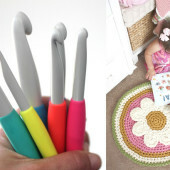 I just have one question – is the pattern written in UK or US crochet terms? I love these! 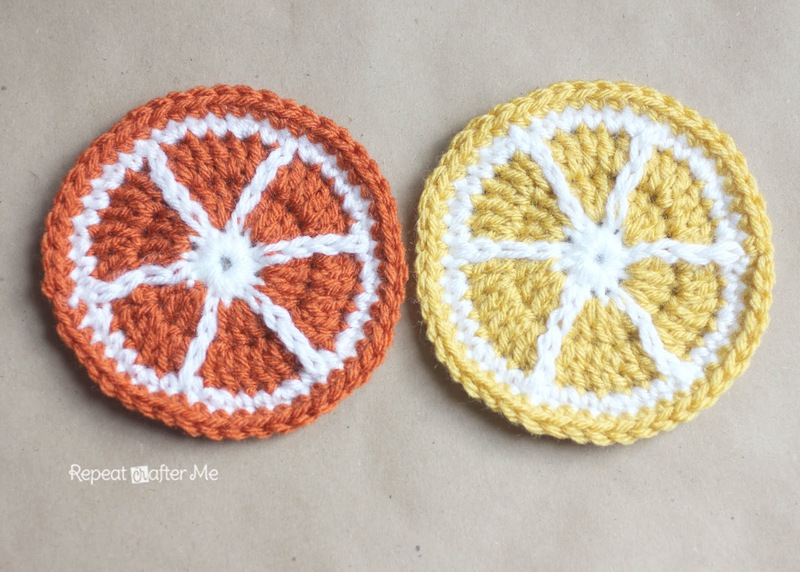 Is it ok for anyone to make these and sell the finished coasters?